Derek Dingle was one of the greatest magicians and sleight of hand artists the world has ever known...and his patter was hilarious. Learn how Derek constructed his brilliant routines and devised his hilariously engaging patter. Included are pix and 10 videos to make this ebook totally understandable..."see" how these tricks play. As with all of Paul's ebooks, his many effects, and his many contributions and publications, every "fine point" has been eked out in detail, and his "tips of performance" are completely explained...this is the real deal. Paul befriended Derek Dingle years ago and learned one of his best secrets...how to entertain people. The Introduction is a hilarious look at how Derek conducted his life and how he approached his magic. This ebook contains Derek Dingle's best and most-used routines, and his funniest patter lines. His magic is amazing. The Fabulous Jumping Card Trick - This side-splitting routine can be played close-up, cabaret, or even stage. Paul takes you through each and every step. See the included video of Derek performing this effect. The audience will laugh throughout and applaud you...it plays huge. Easy to do. Hypnotic Quick 3-Way - This is an easy yet amazing piece of Magic, with a video, using only three cards...this is Paul's rendition of Marlo, Dingle, and Cummins tricks, spliced together for a hilarious routine with only 3 cards that will captivate your spectators - the patter really sells this routine. The Bluff Shift - This is not the Bluff Pass. This is a truly brilliant method to control selections, or 4 of a kind - right under their noses...without appearing to have done anything! A true magician-fooler. Comes with a video. Slot Machine - Derek was personally taught a brilliant routine by Dr. Sawa...but Derek changed this bit of "theater" into a very easy to do masterpiece that will tickle the kids and startle your spectators. His one is fun to do. Too Many Cards - Love this routine! It combines the Ambitious Card with the Elevator themes and (combined with Derek's brilliant, funny patter) ends with a startling kicker. Video included of Dingle performing this effect. 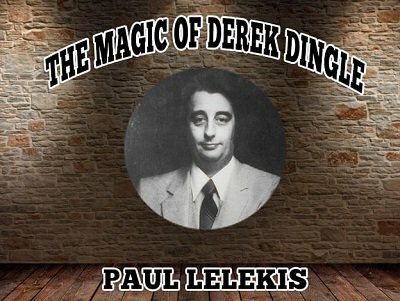 Derek Dingle is one of the greats and Paul has done an excellent job of selecting some classic Dingle and putting his own touches on it. Great job Paul!